As a graduate of industrial design, I have a huge appreciation for the design of products. I'm someone who likes to surround herself with things that are visually pleasing and not just eye-catching, but things that make me smile. My kitchen is filled with shark-shaped oven mitts, tea towels with surfing dinosaurs embroidered on them, and a toothpick holder that looks like a rabbit coming out of a hat. You could say whimsy and cuteness are the themes of my style. This is what I started with, the Antec Skeleton computer tower. Pretty cool design but very masculine, don't you think? Next, I borrowed my parents garage to spray paint. We placed the computer on top of a few crates with plastic so that the garage wasn't sprayed pink and also so I could get low around all of the undersides and crevices. 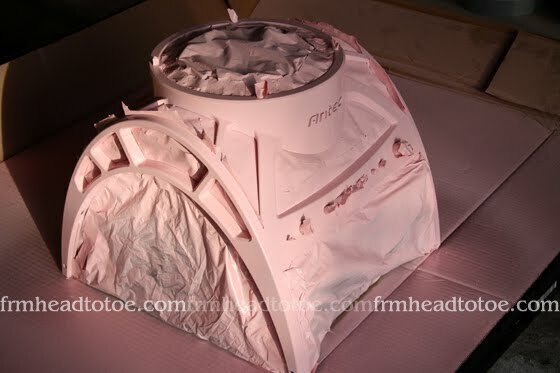 It took 2 cans of baby pink spray paint and 4-5 good coats. I also went back over it with a few coats of a sparkle top coat that I bought at the auto supply shop! After I let my baby dry overnight I carefully peeled off all of the tape and here was the result! Baby pink goodness. I know this isn't the best shot but I wanted to show a close-up of the holographic goodness of the top coat. The sparkles are so fine, it's hard to get it on camera but if you look in the middle of the photo here you can see a bit of the rainbow effect. Wahahaha, I am a crafty one but what can I say? I love my pink. THATS SO COOL!! :) you're so pretty & i love reading your blogs! That is truly impressive and techy. you go girl! 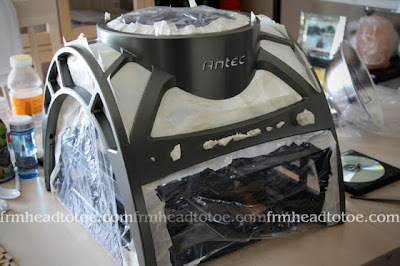 when i first saw the antec, i thought it was a stove for the outdoors or for camping. lol. LOL...this is awesome. Kudos for taking on such a challenge. And double kudos for the sparkle paint. Funny that this was posted today. I was just thinking about the fact that the only way I'd be able to find a teal monitor and keyboard would be to paint them myself. great job! and its a nice kind of finish! i love it! Guys really think that us girls can only stay pretty and put on make-up... Little did they know that we can also paint and do mechanical things like them!!! Hahaha! how cute! love the color..great job! Oohh Love it Jen! Love the finish! Love the outfit btw. It looks so comfy ;) and you look so cute in it. That's some pretty mad awesome modding. :) The colour is so lovely! 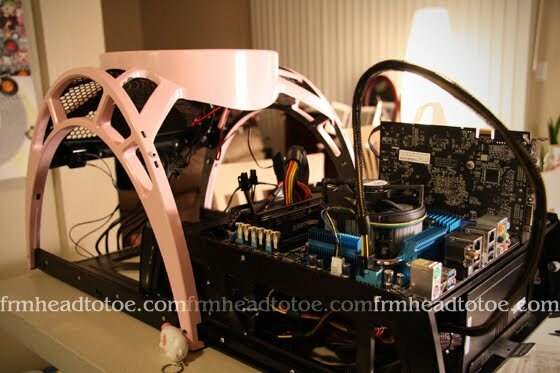 Love your pink computer and I love DIY stuff! Cute blog! LOVE it! I'm in the middle of assembling my tower, too!! Never thought of spray painting the casing though... seriously tempted to do so now. =D I was just going to put in pink lights! i love it!! i love things that are customized. puts some personality into inanimate objects! good job!! 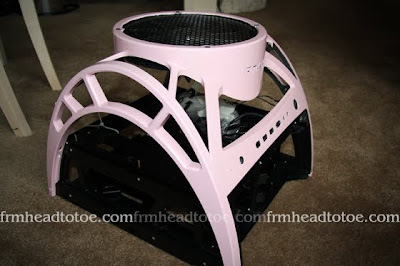 I did pinked out my PC tower too when I was in college and everyone thought I was crazy! 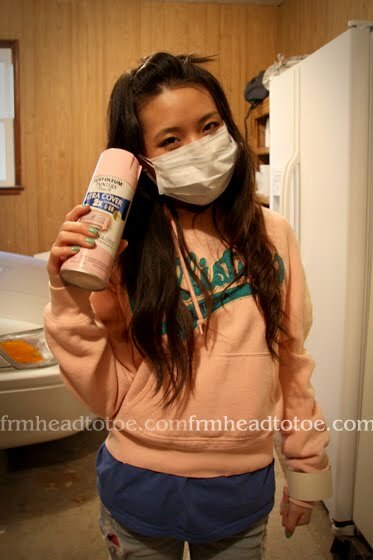 Awesome that you customized yours and spray painted it baby pink! i love how you layered the pink so it's more 3-d! your computer is so awesome! haha PIMP YOUR COMPUTER WITH JEN! jen i just started following your blog and i'm so impressed by your mechanical side! love a girl who can be handy and look cute! Love it! I have never seen a computer tower like that. 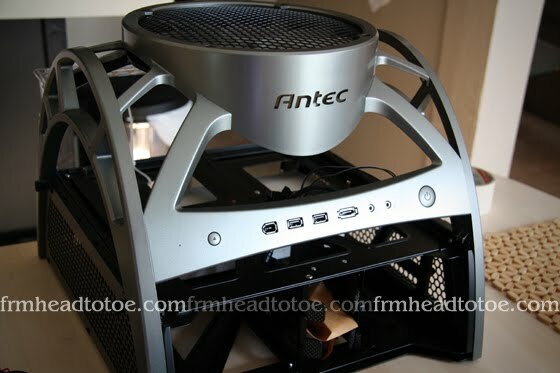 I would imagine the open air design helps a lot with cooling the computer. did you manage to stay in the industrial design field or no? Very cute. Nerdy girls FTW. I am impressed with your Industrial Design skills. I am a Product & Digital Design student ^_^.x. 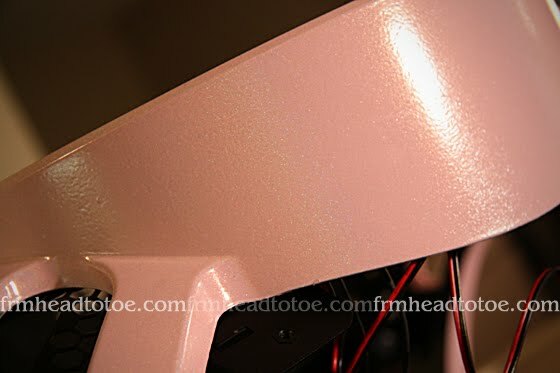 The pink shimmer is very sweet I am going to look for something similar now for my PC. wow! i never knew you're an industrial design graduate!! so am i!! =]so i guess, spraying is part of what a MUST in that course! all the best in life Jen! !